Have you ever wondered what your pet is thinking? Jeremy is definitely not an animal lover, and now his financial future and the fate of his business is in the paws of six cats. Jeremy’s frustration is completely understandable. He isn’t heartless in regards to his late aunt. He is just trying to save his company and the employees who depend on him. Marty doesn’t like the situation any more than Jeremy. She is just trying to honor the wishes of Ms. Addie, the only person who cared for Marty and accepted her unusual gift. Marty gently tries to give Jeremy helpful hints in dealing with the cats, but I don’t think Jeremy is trying very hard. Will Jeremy, Marty, and the cats find a way to coexist, or will the cats run Jeremy out of the house before the month is over? Jeremy and Marty’s situation certainly is unique. However, I don’t think they were as rounded as they could have been. Jeremy is the typical uptight businessman trying to prove he can be a success, but ends up missing out on life in the process. Marty is the quirky young woman shunned by her small town looking for love and acceptance. Also, Jeremy and Marty always seem to be uncomfortable around each other. I expected them to be nervous at first, but hoped things would change as the story progressed. However, they didn’t spend very much time together and their interactions never really smoothed out. Whenever they spent any length of time around each other, it was always awkward. Consequently, their connection never clicked for me and their romance didn’t feel natural. 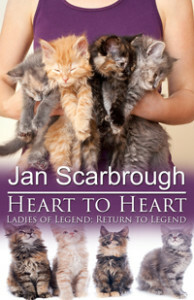 The cats were the real stars of Heart to Heart. The cats all had distinct personalities and their antics were hilarious. I’ve always had fun imagining what my pets are saying, so reading Ms. Scarbrough’s interpretation of how animals communicate was very entertaining and brought a smile to my face. Overall, I liked Heart to Heart. It is a light and fun romance sure to delight animal lovers. Looking for a pleasant book to read in one sitting? I recommend giving Heart to Heart a try.